Load it with amp modules to provide paging and background music in large multi-zone systems like hotels, and hospitals. By buying this product you'll earn up to 876 Rewards points. 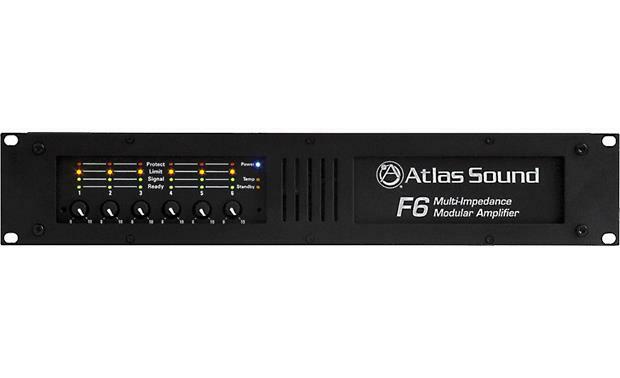 Atlas Sound's F6 Amplifier Mainframe System consists of a power supply, input, signal routing, and control mainframe support unit, with slots for six 250-watt amplifier modules and an 8-channel mixer (all sold separately). 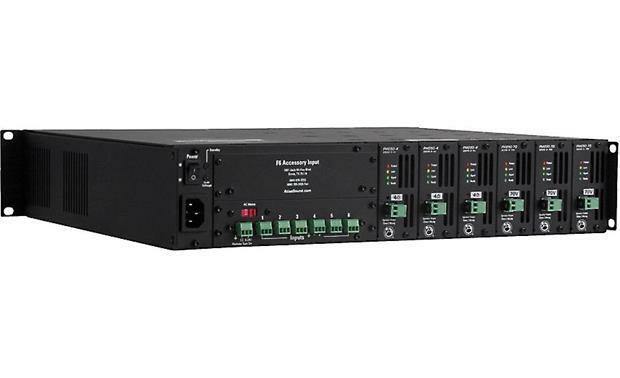 When loaded, the F6 Main Frame becomes an extremely versatile and powerful amplifier system capable of handling paging and background music in large multi-zone applications like office buildings, hotels, and hospitals. 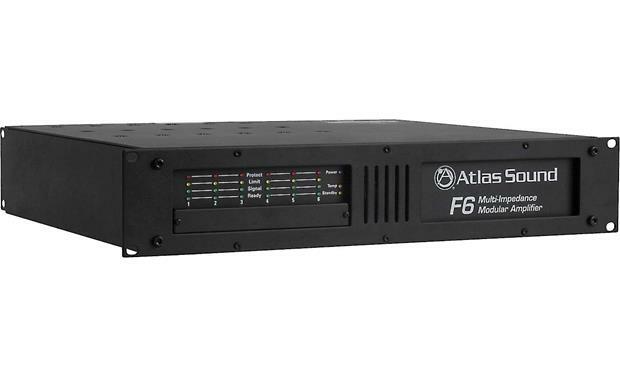 Because of its modular nature, you can configure your F6-MF with just the right number of amplifiers you need at first, and then add modules later as your business or institution grows. 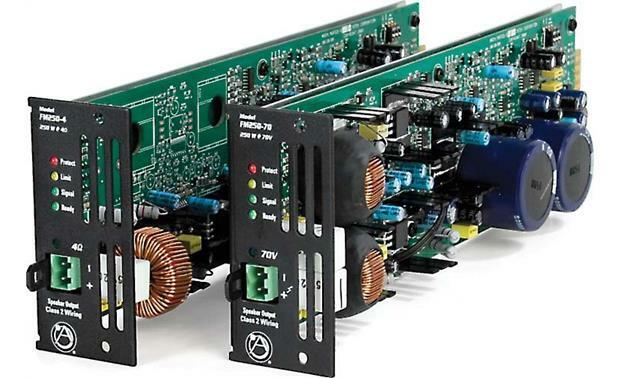 Two kinds of amp modules are offered: the FM250-4 module for 4- or 8-ohm speakers, and the FM250-70 module for use in 70-volt distributed power speaker systems. An optional mixer module adds two inputs, distribution, and muting control to the system. 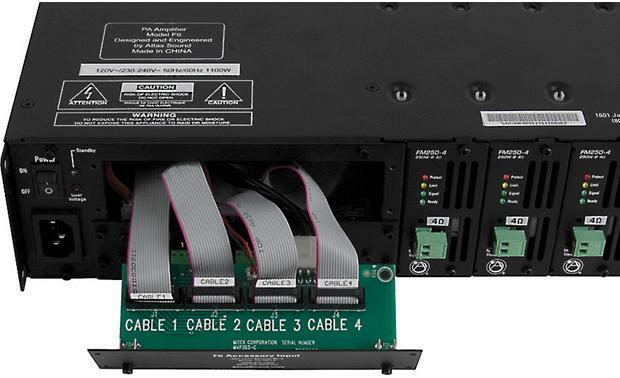 The rack-mountable F6-MF features front-panel status LEDs and level controls for the six amplifier channels. A cooling fan ensures that the 250-watt amplifier modules won't overheat. 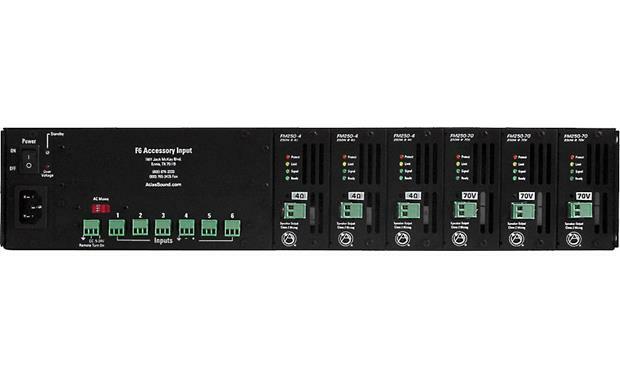 The power supply uses a special technology to direct all available energy to the channels that need it the most, increasing the amplifier system's overall efficiency. 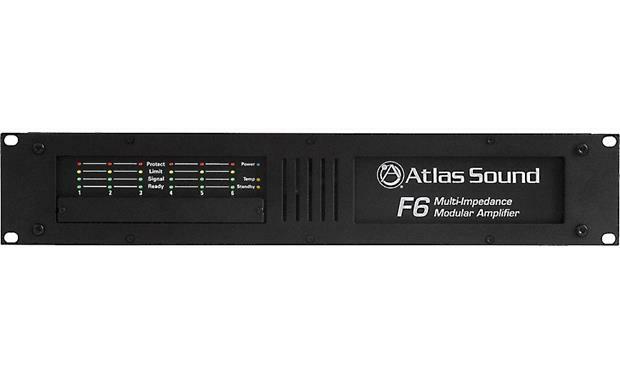 Overview: The Atlas F6 Amplifier Mainframe System is a versatile, multi-channel, modular amplifier that can be configured for both 4/8Ω and 70.7 volt applications. Ready: Will light green when an FM250 power module is installed in that slot and the F6 is powered on. 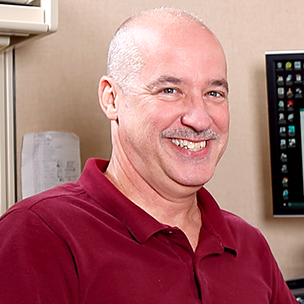 Signal: Will light green when an FM250 amp module's output signal produces a minimum 1 watt signal. Limit: If an FM250 amp module's function switch is set to Limit, the the LED will light yellow acting as a maximum level indicator. If the amp module's Limit function is off, the LED acts as a Clip indicator. Also, under low impedance loads, the LED serves as a current Limit indicator. Power: Indicates On or Off. 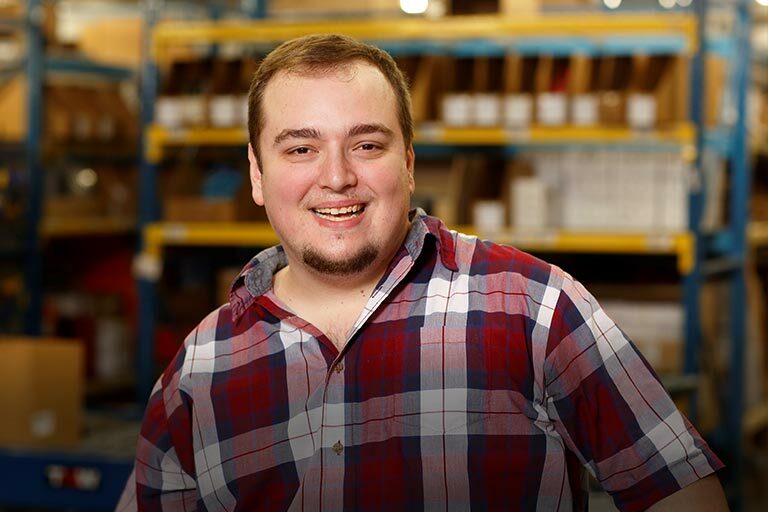 Temp: This LED will light yellow if any of the amp modules reach 10% of their Thermal Protect shut off and the cooling fan is at its maximum cooling capacity. Protect: This LED will light red and the output will shut of if any of the following are detected: Shorted speaker output, Thermal shut down, Current Overdrive, if the amp channel is driving too low a speaker impedance. Modules: Each of the FM250 amp modules outputs 250 watts and comes in 2 models: FM2504 for driving 4 or 8 Ω speakers, and the FM25070 for 70.7 volt applications. Both designs feature a defeatable limiter and a high-pass filter. 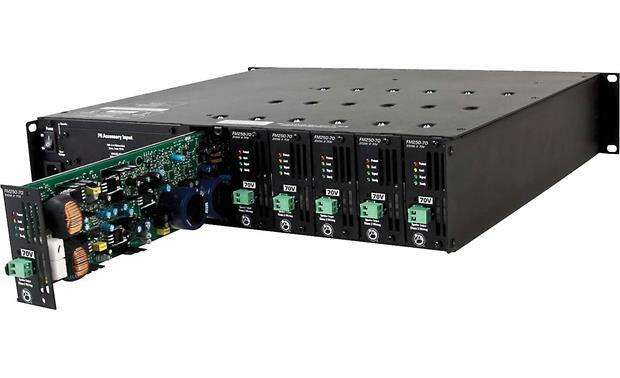 Their ultra-efficient Class D amplification technology is designed to be 90% efficient, allowing the amp to run cooler and consume less energy than conventional amplifiers. 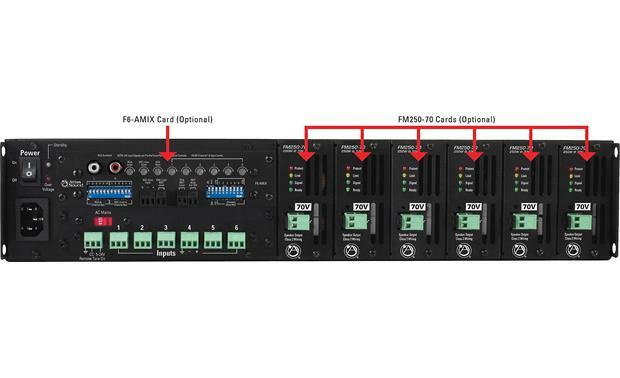 The F6 can also accommodate the F6-AMIX add-on mixer card (sold separately). This feature laden module is an 8 input, 6 output mixer that adds both summed stereo and mic/line inputs with global assignment, signal mixing, and remote level and mute functionality. Power Delay On: 1 - 2 sec. Dimensions: Width - 19.0", Height - 3.0", Depth - 15.5"
Searches related to the Atlas F6-MF Mainframe chassis for F6 amplifier system.